Managing people is difficult wherever you work. But in the tech industry, where management is also a technical discipline, the learning curve can be brutal&#8212;especially when there are few tools, texts, and frameworks to help you. In this practical guide, author Camille Fournier (tech lead turned CTO) takes you through each stage in the journey from engineer to technical manager. From mentoring interns to working with senior staff, you&#8217;ll get actionable advice for approaching various obstacles in your path. This book is ideal whether you&#8217;re a new manager, a mentor, or a more experienced leader looking for fresh advice. 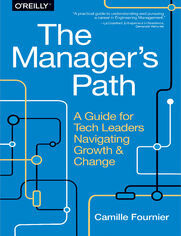 Pick up this book and learn how to become a better manager and leader in your organization. Managing Your Time: Whats Important, Anyway? Whats a VP of Engineering?